I love veganizing meat- and dairy-heavy dishes: it’s an opportunity to be creative and produce dishes that allow me to stay in alignment with my strong belief that animals aren’t food. Things like vegan burgers, cheese and bacon are always fun to recreate. It’s less about trying to “make” food be something that it’s not, and more about recreating the textures and flavors (smoke, saltiness, umami, etc.) that make it so good in the first place. Sometimes I see something I want to veganize, but never had before, so I’m not sure how it’s supposed to taste. There’s no sensory experience to capture or memory attached to it. But that’s not really a negative: it leaves room open to interpret the dish and make something unique. 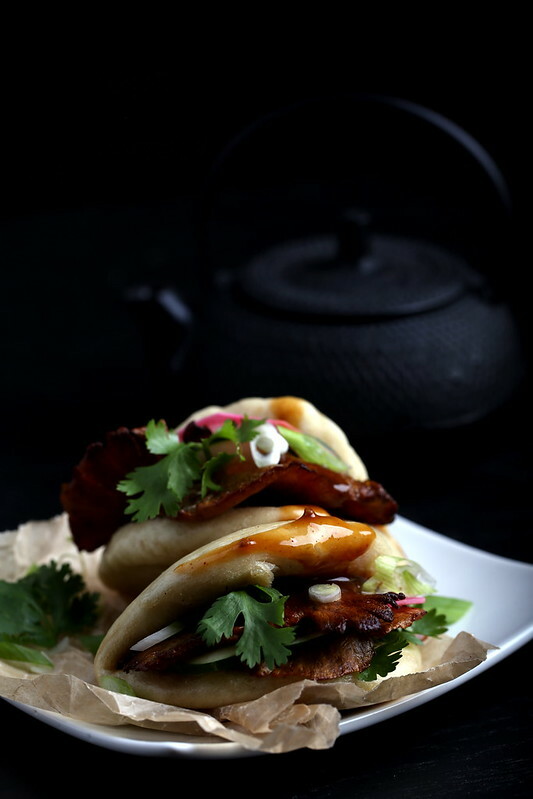 An example of that are these puffy vegan pork buns! 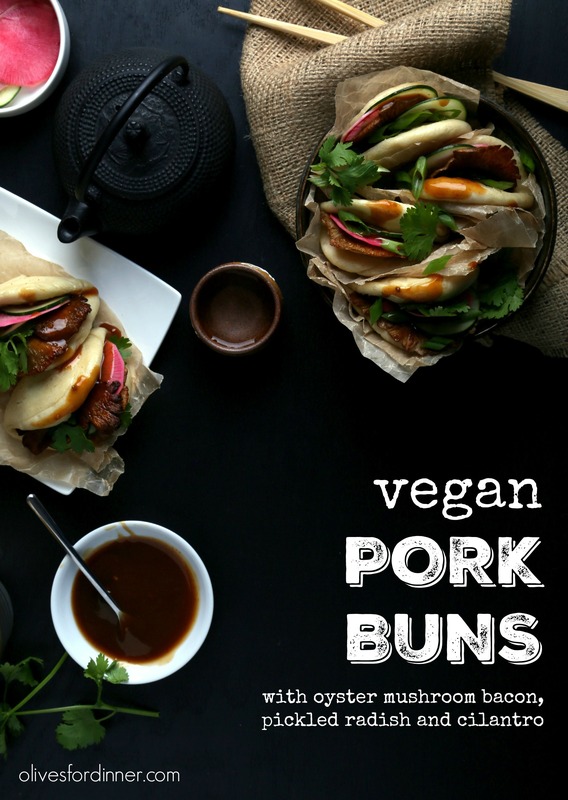 This iconic Momofuku pork bun recipe produced perfect little pillowy buns with a little hit of sweetness and subtle chewiness by simply leaving out the milk powder and subbing refined coconut oil and liquid smoke for the pork fat. It worked well with the crispy and succulent oyster mushroom bacon nestled alongside some rich hoisin, clean cilantro and cucumber, with spicy scallions and a little pickled radish to provide color and balance everything out. And they look dynamite once assembled and ready to go! You can also fill these with jackfruit, shiitake or maitake bacon or tempura-fried vegan scallops. To make these vegan, I left out the milk powder and swapped out the pork fat with 1/3 cup refined melted coconut oil with 1/2 tsp liquid smoke whisked in. This recipe says it makes 25 buns, but says in step 2 that it makes 50 buns. I made about 35 buns following this recipe. I found that the dough was easier to work with rolled into balls then chilled. The recipe says you can steam them all and freeze, but I found it better to store the dough rolled into balls and only rolling out the desired amount for steaming. To make the oyster mushroom bacon, combine the oils, liquid smoke and salt in a large bowl. Toss the mushrooms to coat. Place the mushrooms gill side down in a cast iron pan or baking sheet, taking care not to crowd them. After 10 minutes, if there is a lot of moisture in the bottom of the pan or sheet, remove from the oven and tilt to collect and discard with a spoon. Return to the oven and bake for 5 minutes more, watching them carefully to avoid burning. Flip, then bake for about 5 minutes more, or until they have a nice color around the edges, keeping a close eye on them. Transfer to paper towels to drain slightly and allow them to crisp up. 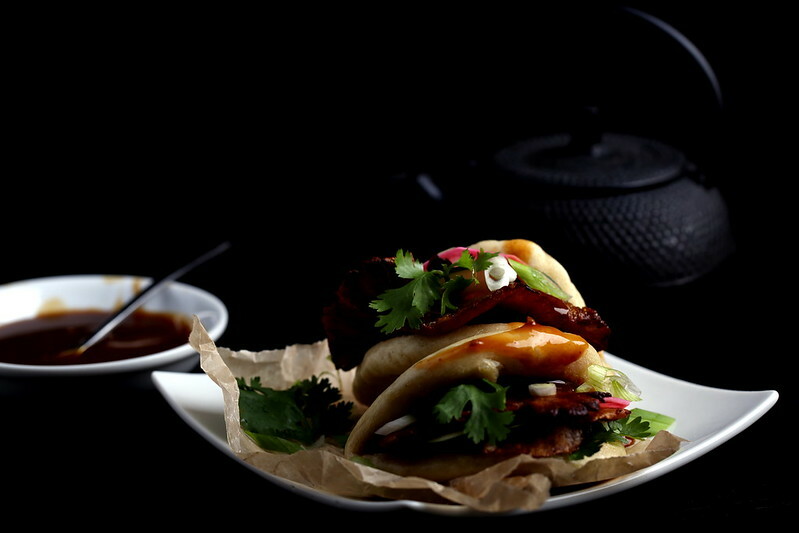 To serve, assemble the steamed buns with hoison sauce, one or two pieces of mushroom, something pickled, scallions and fresh cilantro. Serve warm. What brand of liquid smoke do you use? I always see measurements for it in your recipes in teaspoons, but the types of liquid smoke I've used have been so strong that anything more than a few drops makes your food taste like a fire pit. I use Colgin brand, but I think they are all pretty much the same. Liquid smoke needs to be heated or allowed to mellow in most applications. If you do this and find you still don't like the taste, you can always whisk a little smoked paprika into olive oil to get similar results. I made these last night. Man oh man. This is the end-all be-all of comfort food for me. Something to include in my death row last meal. As a kid, my mom would get steamed bbq pork bao from a Chinese market down the street. I’d scrape out the pork and eat the bbq sauce-soaked bun on it’s own. The buns were white and fluffy and oh so delicious. Since going vegan, I’ve had a few vegan pork buns, but they never lived up. Until now. So my oyster bacon didn’t turn out crispy and my buns were a bit lopsided, but who cares? The flavor and texture were ALL THERE. My steamer only fits 3 buns, and for every batch, 2 went on the plate, and the other was hastily assembled and shoveled straight into my mouth. I ate dinner standing up. It was MARVELOUS. Thank you for posting.